In this concert for Remembrance Sunday, City of Bristol Choir is joined by the Lochrian Ensemble to perform Fauré’s beautiful setting of the Requiem and Vaughan Williams’ Dona Nobis Pacem. 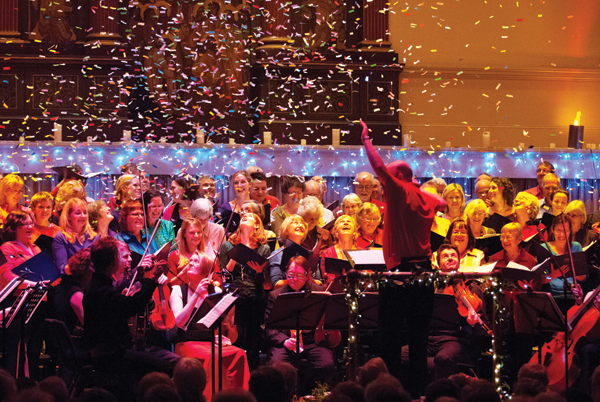 A musical treat for all the family to kick-start Christmas, as the Bristol Schools Chamber Choir showcases the wonderful vocal abilities of its young performers with a selection of festive favourites traditional and modern. At the heart of the programme is a performance by the Senior Girls Choir of Britten’s beautiful Ceremony of Carols, accompanied by harpist Kate Watt. Two glorious evenings of festive music performed by the 80 voices of City of Bristol Choir (Saturday) and accomplished chamber choir Exultate Singers (Monday) under the baton of the entertaining conductor David Ogden, including sparkling arrangements of Christmas music for choir and orchestra, audience carols, readings and Christmas pieces for orchestra alone. Exultate Singers will travel to Italy to give two concerts in Vicenza and Lecco, and sing Mass in Basilica San Marco, Venice. As part of the Bristol Festival of Song 2013, Exultate Singers performs an atmospheric programme of music written for the Russian and Greek Orthodox churches, including works by John Tavener, Rachmaninov, Tchaikovsky, Chesnokov, Schnittke and Grechaninov. This is music of pure theatre – passionate, lyrical and hypnotic. Exultate Singers is known for its engaging performances, making use of the building’s spatial effects with singers placed in different positions around the church throughout the concert. For particular pieces of music, the singers encircle the audience, enveloping it with stunning live surround sound, a spellbinding experience. David conducts the RSCM Millennium Youth Choir in three concerts in Prague, Teplice and Jičín during the choir’s Summer Course tour of the Czech Republic. The choir, accompanied by organist Daniel Moult, will also sing Mass and give a recital at St Vitus’ Cathedral in Prague. Vocal coach Hilary Llystyn Jones will work with the singers alongside David on the tour.